I say I’m a serial monogamist—laughingly, but it’s true. I stay with—explore—a thing until love fades, or a new interest overtakes me. Right now my passion is writing—which overtook rug hooking, which replaced teaching, which overtook pioneering, which replaced theatre…you get the idea. My mother once said, in a temper with my teenage sauciness, “you’re nothing but a good-time girl.” She was right! Well, like Edith Piaf, je ne regrette rien—rien de rien. This writing passion is a joy. People, remarkable people who delight in sharing their knowledge and offering their support, have filled this adventure with kindness and light. I’ve been learning the mysteries of poetry from amazing people like (in reverse alphabetical order) Jan Zwicky, E. Alex Pierce, Don McKay, Carole Glasser Langille, Sue Goyette, Lorri Neilsen Glenn, Barry Dempster, Brian Bartlett. I’ve been learning how picture books take form, working with Meghan Collins, erstwhile of Formac; how contracts are negotiated, with Marian Hebb, erstwhile the lawyer for the Writers’ Union of Canada. Thanks to the Writers’ Federation of Nova Scotia and its Writers In The Schools program, I’ve been sharing some of the glories of Sable Island with youngsters, because of the generosity of Zoe Lucas, who invited me to the island to help start a list of the island’s fungi; and because of Sylvia Gunnery (recipient of the Prime Minister’s Award for Teaching Excellence), who invited me to write a child’s chapter book about Sable for a series she was editing; and because of my mother, Joyce Barkhouse, CM, ONS (Member of the Order of Canada, and Order of Nova Scotia), who insisted I write the text for the picture book created from her children’s novel Pit Pony. (Gem, the story’s heroic horse, comes from Sable Island). The fun continues. My chapbook, Silence, was mentioned (so generously) by my cousin Margaret Atwood in one of her New York Times articles. It is available from its creator Nancy French (Lindenlea Paper) on Etsy. My own picture book, Keeper of the Light (Halifax: Formac, 2016), illustrated by Thérèse Cilia (who brings such sensitivity to her vivid and carefully researched images of a young girl working in the 1920s at a lighthouse off the coast of Nova Scotia), was a joy to work on, and is a joy to share. Sable Island Fieldnotes: poems by Janet Barkhouse, photographs by Zoe Lucas has its own page on this website, which I hope you will visit. Now I have a full-length book of poems, Salt Fires, published Fall 2018, by Lesley Choyce’s Pottersfield Press. It now has its own page here, too. You can see this journey hasn’t come to its end yet. I am a proud member of the Writers’ Federation of Nova Scotia Council. 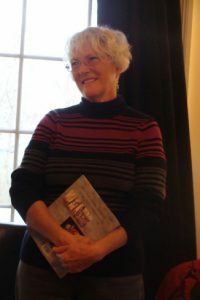 The new Programming and Membership Officer, Annick MacAskill, is keeping a blog of interviews with Nova Scotia writers. Annick is a brilliant poet, and she brings out the best in our stories. I’m one of the interviewees if you’d like to investigate. I am also a member of The Writers’ Union of Canada, and of Canadian Women in the Literary Arts, and now of the League of Canadian Poets. I was Artist in Residence at Dalhousie with my daughter, singer-songwriter Alex Hickey, in 2013-14.